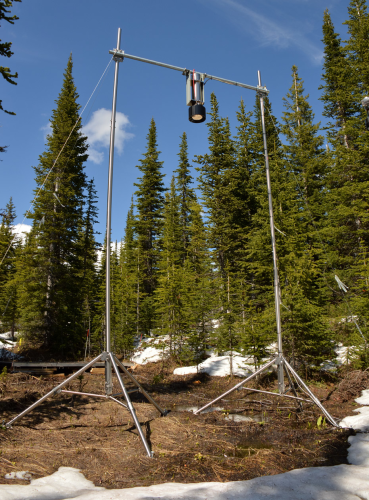 Snow melt is a large source of fresh water in many areas of the world, making its measurement important for the management of water resources. Snow water equivalent (SWE) is the measurement of how much water is present within a snowpack. To make sound water management decisions, it is essential that SWE measurements be as effective and accurate as possible. Water in a snow pack is determined by depth, density, type of snow, changes in the pack, previous freeze/thaw cycles, recent rainfall events, etc. Available water is the amount of water that would be released if the snow pack melted. Of course, the actual amount of water affecting a river basin would depend on weather conditions during the melt and potential absorption into the soil, but knowing how much water is available in the snow pack is valuable for those managing reservoirs and flood forecasting. We offer a variety of products that can be used to create systems for Snow Water Equivalent (SWE) Measurement. Many of the major components used to create these systems are listed below. Please let us know if we can help you configure a system. A non-contact technology has been available for many years but only in the last few years has it become commercially available. This technology uses the principle that soil and overburden often have naturally occurring radioactive elements, in particular, Potassium and Thallium, that emit weak gamma radiation and that when water is present, this radiation has a progressive reduction in strength. The higher the water content the higher the attenuation of the gamma rays. Simple in principle, a little more challenging in real-world applications (winter conditions, remote, no AC power). In 2009, Hydro Quebec and Campbell Scientific (Canada) Corp collaborated on a joint project to bring this technology, known as the CS725 SWE Sensor, to market. After years of field trials in British Columbia, Quebec, Norway, Utah, and New York State, this technology has been proven to be quite reliable and accurate. 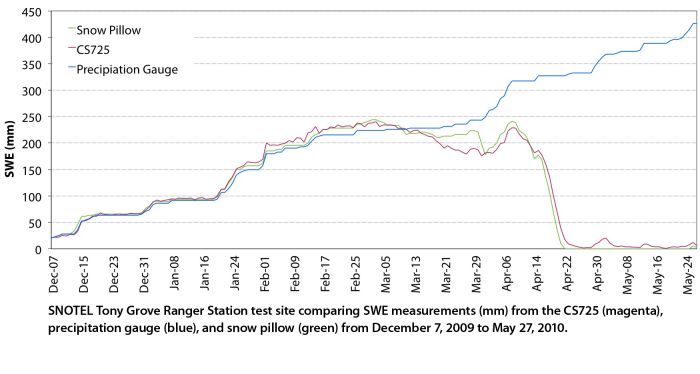 It has demonstrated it’s particularly good for measuring SWE during periods when liquid water is present in the snow pack. Liquid water in the snow pack can lead other techniques to have very poor accuracies (click to enlarge graph). 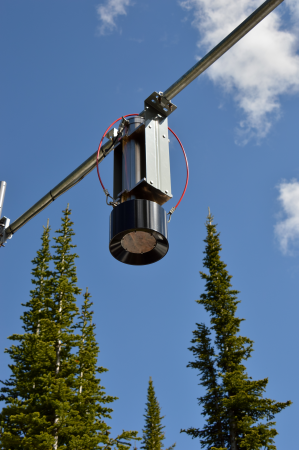 To operate, the CS725 is mounted pre-snowfall, hanging from a 1 ½ to 2” horizontal pipe far enough from the ground that it will not affect snow accumulation. The sensor can be connected to a data logger or modem with RS232 input. The CS725 measures SWE over a large surface area (50-100m2 when mounted 3m above the ground), and it utilizes a technique that is effective with any type of snow and ice. Its performance is not affected by adverse weather conditions or bridging. Once installed, the CS725 can be left in the field for seven years maintenance-free after which it must be returned to the factory for internal battery replacement and check-over. The CS725 is presently limited to a maximum range of approximately 600mm of SWE and is dependent on a suitable amount of terrestrial gamma radiation. Also, it must be site calibrated under snow-free conditions and requires known soil moisture, which is typically obtained with a soil moisture probe, just before ground freeze-up.